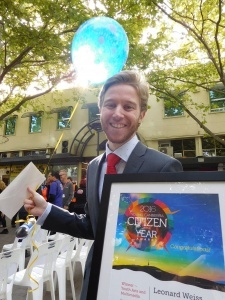 MULTI-TALENTED Canberra musician Leonard Weiss has been named as the 2016 Young Canberra Citizen of the Year for Youth Arts and Multimedia. In a ceremony on Friday as part of National Youth Week. The Act Minister for Youth and Multicultural Affairs Yvette Berry praised Weiss for his exceptional efforts in sharing, enhancing and contributing to Canberra’s musical landscape. Earlier in the week, “CityNews” reported on Weiss’s dynamic work as musical director/conductor of the Canberra Youth Orchestra. He also conducts the National Capital Orchestra, the ANU Choral Society, the Canberra Qwire, various school and other community ensembles, as well as coordinating the Classical H-Course at the ANU. There’s no time to rest on his laurels. He was recently announced as the conductor of the 67th Australian Intervarsity Choral Festival in Canberra from July 1-10, and is a private conducting student of educationist Richard Gill. Weiss soon leaves for Belgium, where he will jump straight into intensive studies at the Royal Carillon School “Jef Denyn” in Meclehen.